Can Tho (VNA) – Outcomes of the Food Security Week, which took place in Can Tho from August 18-25, have contributed to materialising one of the four priorities of the APEC Year 2017 that is enhancing food security and sustainable development in response to climate change. Deputy Minister of Agriculture and Rural Development Le Quoc Doanh made the remark at a press conference in Can Tho city on August 25. 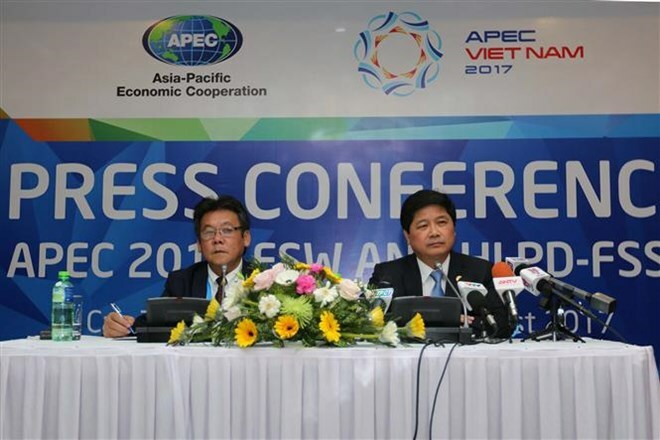 He added that the result also demonstrates APEC member economies’ commitments to contributing to realising the UN Sustainable Development Goals (SDGs) by 2030. During the week, APEC member economies adopted three important documents - the Action Plan to implement the Multi-Year Framework Programme on Food Security and Climate Change, the Action Plan to implement the Strategic Framework on Rural-Urban Development to Strengthen Food Security and Quality Growth, and the Can Tho Statement on Enhancing Food Security and Sustainable Agriculture in Response to Climate Change. The Action Plan to implement the Multi-Year Framework Programme on Food Security and Climate Change aims to fulfill the APEC Food Security Roadmap Towards 2020 and Bogor Goals 2020. Furthermore, the plan will promote more coordinated regional efforts to address the closely linked challenges to food security, development, and climate change adaptation and mitigation. It focuses on policies, best practices, technologies and levels of capacity of the APEC economies. The Action Plan to implement the Strategic Framework on Rural-Urban Development to Strengthen Food Security and Quality Growth is expected to fulfil the APEC Food Security Roadmap Towards 2020 and the 2014 APEC Connectivity Blueprint. The plan will promote a learning agenda for the APEC region on rural-urban development as well as more coordinated efforts to address food security and quality growth challenges brought about by rapid urbanisation. The plan aims to address challenges associated with rural-urban development and food security by pursuing four concurrent areas, as determined in the Strategic Framework: inclusive economic development, sustainable natural resource management, social aspect and administrative efficiency. It calls for the member economies to develop activities based on the strategies outlined in the Strategic Framework and to consider the role of the private sector in those activities. The actions are to be voluntary and the member economies have the direction to undertake all or some of the activities based on their domestic circumstance. Meanwhile, the Can Tho Statement recognises the linkages between food security, poverty, climate change and sustainable development. Sustainable and resilient agriculture, aquaculture and fisheries contribute significantly to enhancing food security, rural employment, poverty reduction, community empowerment, economic development, environmental protection and adaptation to climate change. In the statement, APEC ministers and high-level representatives responsible for food security and agriculture call on the economies to strengthen and coordinate efforts at global, regional and economic levels in developing sustainable agriculture, livestock, aquaculture, and fisheries systems that are sensitive to climate change, as appropriate. They are conscious that the region’s natural resources are under stress from overconsumption, land and maritime habitat degradation, fresh water scarcity and loss of biodiversity. Greater concreted efforts, including cross-border coordination, to foster sustainable use and management of land, forests, water and marine resources, are essential to both food security and environmental protection. The statement says it is critical to strengthen policy and technical cooperation to improve governance and sustainable use of natural resources while securing long-term food supply. It encourages the APEC member economies to share best practices and experiences in promoting sustainable rural-urban development and growth, including empowering disadvantaged groups, smallholders and micro, small- and medium-sized enterprises in agriculture, to secure livelihoods, reduce poverty and improve food security for farming and fishing communities. The statement calls for further joint efforts in promoting trade facilitation, innovative technologies and food market access transparency to help both importing and exporting economies adapt to food price volatility. An enabling policy and regulatory environment is also needed to foster and facilitate investment in rural transport, connectivity, logistics, agro-industry clusters and other services to improve farming, food processing and the linkage of food markets, it says. The statement also says post-harvest food loss and waste remain a challenge that demands further actions, including infrastructure development as well as implementation of innovative technologies among APEC member economies. The collaboration and coordination of regional initiatives on food loss and waste reduction is essential. The Food Security Week brought together two ministers, seven deputy ministers and nearly 700 delegates from the APEC member economies, international organisations and research institutes. The week featured 17 events, including high-level dialogues, annual meetings of APEC working groups, symposiums, an exhibition and fact-finding trips. Bilateral meetings between leaders in charge of agriculture of the APEC economies were also held during the week. Of note, Vietnam and Australia signed a letter of intent on long-term cooperation in agricultural research and a memorandum of understanding on cooperation in combating illegal, unreported and unregulated fishing.